We had a great weekend at the Art in the Garden sale at Rancho Santa Ana Botanic Garden, in spite of the ever-present threat of rain. 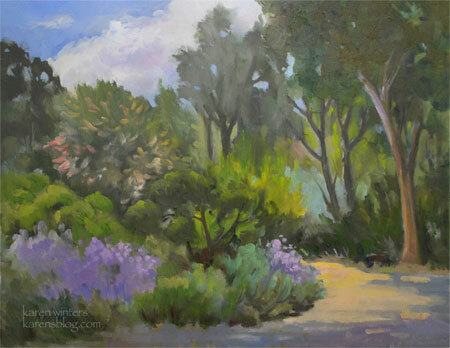 In spite of the light turnout, some of my paintings found new homes and I had a chance to set up my easel and paint a nearby path in the beautiful California native plant gardens. This scene features a blooming California buckeye (in the background, a spreading pine, several clumps of sages and a variety of oak trees. Most of the day was gray, but occasionally the sun would break through. 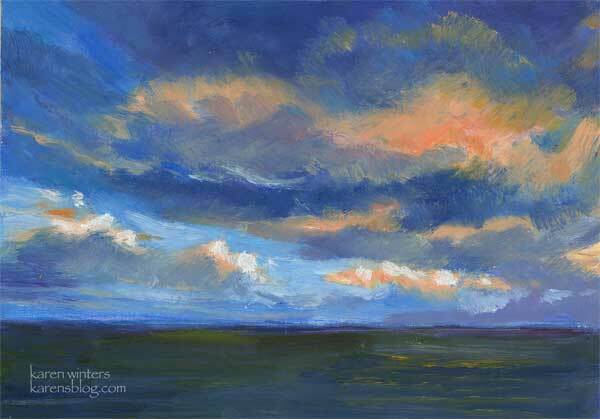 Now I have a break until the San Clemente paintout and sale, ending on June 27-28 (details to come.) If you live in the coastal OC, I hope you can come. 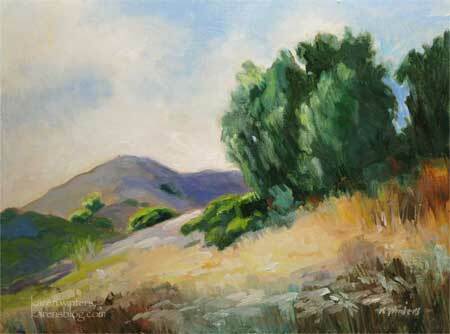 For information about other Idyllwild paintings, please write. Idyllwild, California, has always been one of our favorite places to retreat. We began visiting when we were first married, and always loved the beautiful mountain sunsets. 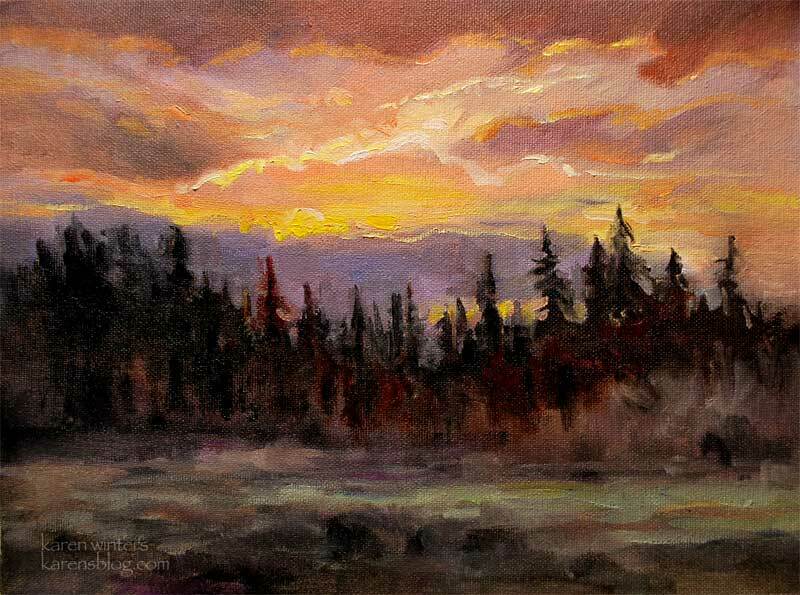 Once we stopped our car and watched in awe, while classical music played from a nearby cabin. 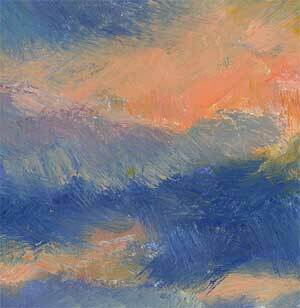 This is a recreation of that spectacular scene, when the sky was awash with color and all was right with the world. I still like to return, in memory, to that golden time. In the wide open heartland of California’s Central Valley, the skies are big and the land is rich and bountiful. This plein aire style impressionistic landscape painting captures the glory of the waning day. 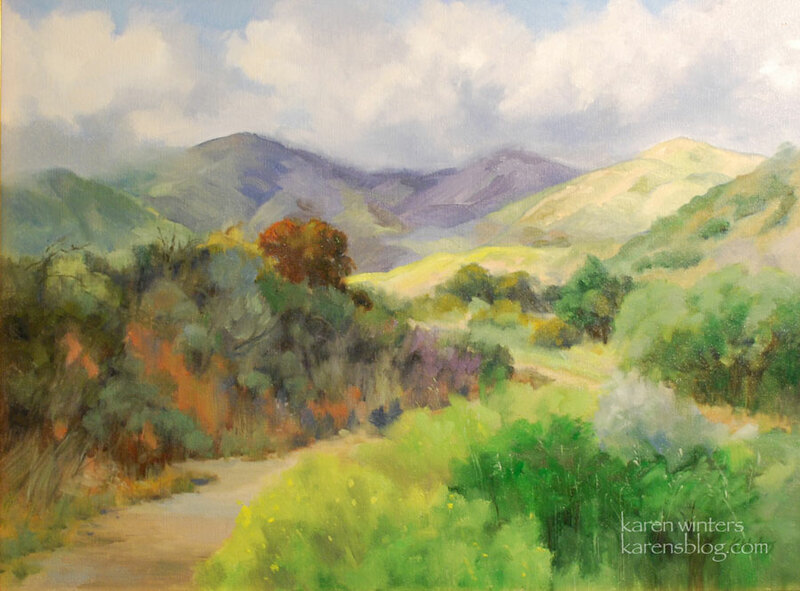 I can’t pinpoint the exact location, but the surrounding names are picturesque, Buttonwillow, Lost Hill, Tranquility. 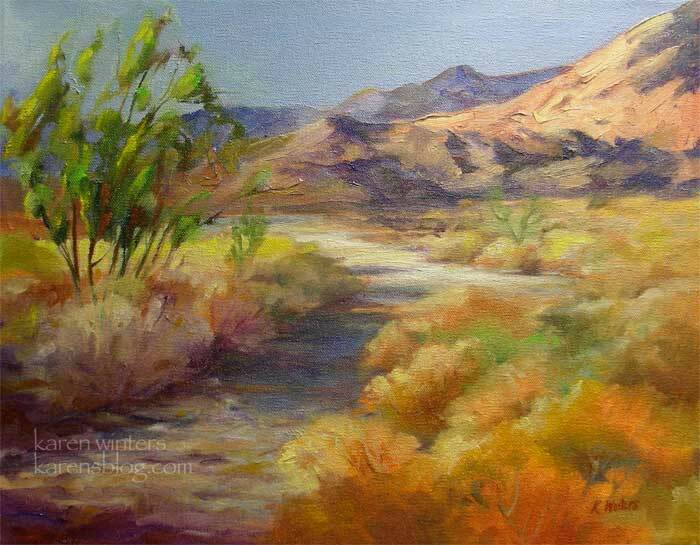 This very new painting (painted last week) was inspired by my recent trip to California’s Anza Borrego State Park in North San Diego County. 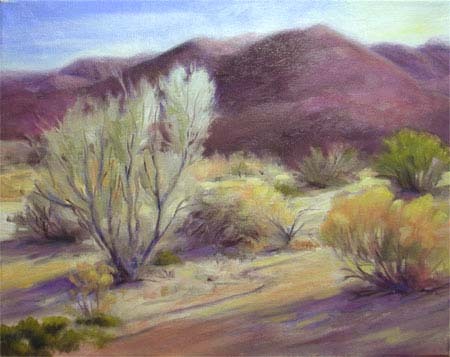 I’ve never been much of a desert person, although one of my warmest memories of a family trip was to see the California desert for the first time – around Joshua Tree, I believe. Perhaps it’s because most of the year it is fairly dry and barren. But when springtime follows a winter of abundant rainfall – stand back. This is the desert as I’ve never seen it before. 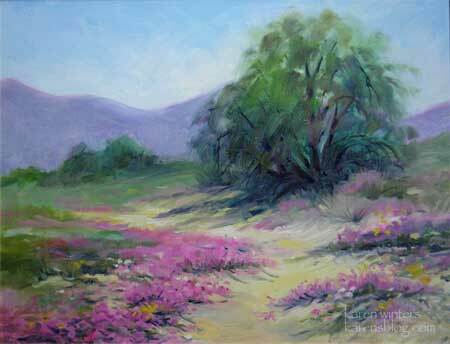 Next year I’ll be looking for new places to paint and take photos with different kinds of flora. If there is someone reading who lives in the North San Diego area and is familiar with the native plants, I’d like to know the name of the tree/shrub, which grow near Coyote Canyon at the upper part of the A-B preserve. Some have said it’s a smoke tree but it seems too full for that. It has some resemblance to a palo verde, but the trunks weren’t green. The foliage is soft and airy and drooping. It grows out in the middle of the desert, in what look like flash flood gullies. It likes sand as opposed to a craggy, rocky habitat. I scan and process my photos on a Mac, which means that it may look slightly different on a PC, even though I have my monitor setup for PC preview, since that’s what more people use. I do my best to get a good color match, but if you’ve ever been in a computer store or the TV department of a large retailer, you know that there are rarely two screens that look alike. I’ve been told that in most cases the painting “in real life” looks even better than on the monitor. Thing two: My name and blog address which appear in one of the corners of the photo are NOT on the painting.That is not how I sign my name. It’s a watermark that I apply digitally to my work so that if it ever gets separated from my site, or if I display it on Flickr (not here) that people know where to go to see more. I usually sign my name very small and subtly in either the lower left or right hand corner, whichever looks best. Thing three: What you see in this post is a low res version so the blog page will load quickly. If you want to see a somewhat higher res version, click the image and it is likely you’ll be able to see more brushstrokes and detail. More paintings coming soon … I have a lot on the easel(s) and I’m doing final tweaking for all the shows coming up this month and next, among them the Art Matters show and sale at the Huntington Library and Gardens in San Marino. More details as the dates approach. Mark your calendar for the weekend of May 2-3-4. Well, I didn’t think it could happen two years in a row, and with such different styles and subject matter, but, happily, it did. I just got my notification in the mail that this painting has been accepted to the 2008 National Watercolor Society All Member show, opening April 19 at the VIVA Gallery in Sherman Oaks, Calif. 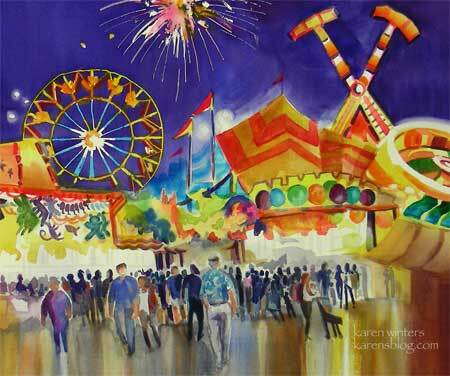 It is an amalgamation of different scenes at the LA County Fair in Pomona, including the Tilt a Whirl, Ferris Wheel and several other rides. This is another one of those projects that I was busily painting over the past few months and that I said I’d share when the time was right. So if I missed some days with daily paintings, now you know why. It was a whole lot of fun to paint (I hope that comes through!) and takes me back to the days when I was an advertising group head and copywriter for the agency that had the fair account. I still enjoy going there to watch the people, animals, shows and more. I didn’t get there last year because it coincided with our Descanso show, but maybe this year! 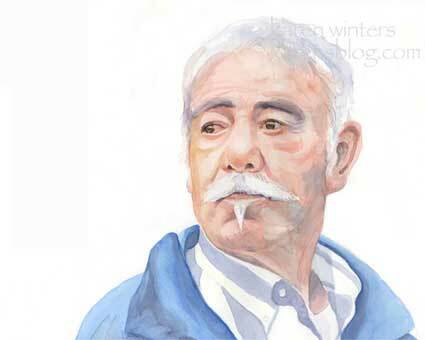 For any of you who are newer readers of this blog, here was my painting in the 2007 NWS all member show.